Simple two-tier display for whiskey glasses. Or ... Bed, bath, and bottoms up. We designed and built a simple one piece two-tier display as pictured. 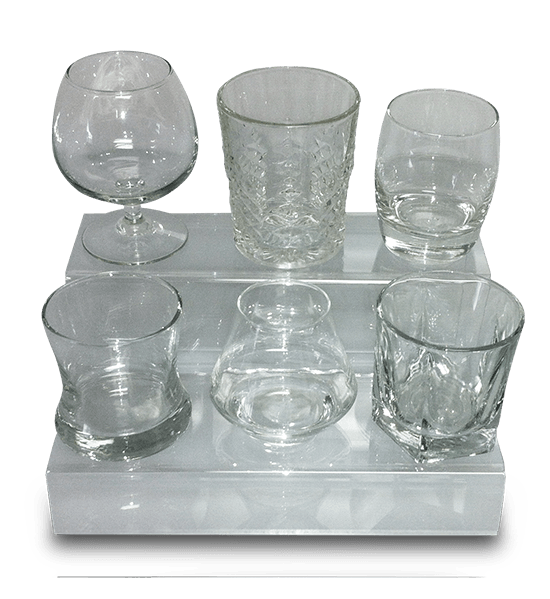 This display requires minimal counter space and elegantly displays all six glasses. In addition, for this project we individually packaged each display in a custom sized carton - with barcode labels for palletized shipment to a central distribution warehouse in Toledo, Ohio. Easy fulfillment from the warehouse to the customer's store. a beautiful and functional retail display to increase sales. We can all toast to that!